Yesterday I posted a review of A Taste of Cowboy by Kent Rollins. Today, Kent arrived at our Tribeca loft at 9AM and started cooking. His chuck wagon was back in Oklahoma, but he had a New York City assignment. Suzen belongs to New York Women’s Culinary Alliance and that group assembled here to sample Kent’s food and helped roll out this wonderful new book. By 10AM I was in heaven. 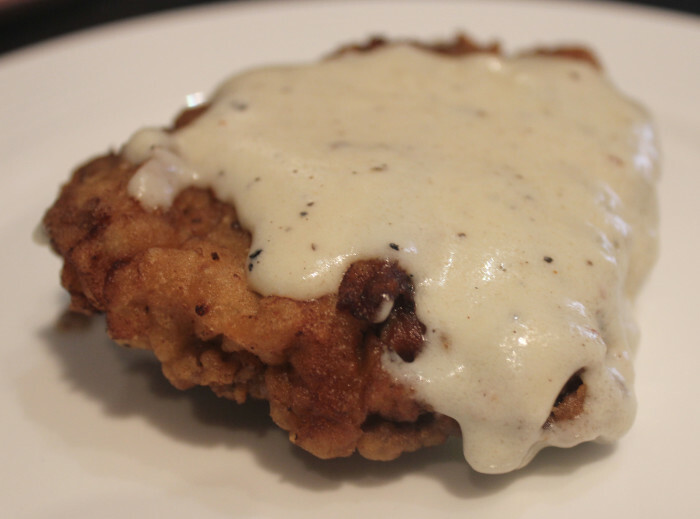 Is there anything better than Chicken-Fried Steak? With oodles of creamy gravy? This is one of Kent’s favorite recipes, the one he cooks the most in his life as a chuck wagon cook on the range. The Throwdown-Winning part comes from that fact that in a contest with Bobby Flay, Kent won with this chicken. Actually, Kent wins a lot of contests. And deservedly. The “trick” here is the batter Kent has created for the steak. He started out using milk or buttermilk and egg, like all the recipes call for. But, unhappy with how the coating did not stick well enough, Kent decided he wanted a thicker, crisper crust. He uses, and this is the surprise, powdered egg and powdered milk. You can use the batter for much more than chicken. Try it on fish or veggies, too. Oh this batter does fry up thick, crispy and superior. It is award winning. If you love chicken-fried steak, then you can do no better than this cowboy spectacular. In a medium bowl, combine the flour, seasoned salt, lemon pepper, and garlic salt. Set aside. In a large saucepan, pot, or deep Dutch oven, pour in enough oil to deep-fry the steaks (2 ½ to 3 inches). Heat the oil over medium-high heat until it reaches about 350°F. Pick up one piece of meat with tongs and dip it into the batter and then into the flour mixture. Be sure both sides are well coated. Repeat, or as I call it, “double baptize.” Repeat with the remaining steaks. Fry the pieces for 3 to 4 minutes on each side, or until golden brown. Cool on a wire rack. Serve warm with the gravy. Heat the grease over medium heat in a large cast iron skillet. Sift in the flour and let it come to a boil for 2 minutes, stirring and mashing down constantly with a flat spatula. Slowly stir in 1 ½ cups of the milk and bring back to a light boil. Continue stirring until the mixture is smooth and reaches the desired consistency, about 2 minutes. You can add more milk or water to thin the gravy, if necessary.